None was more urgent against this counsel than Camillus. "Verily," he would say, "there is nothing at which to marvel in these troubles. The whole state is mad, for, though it is bound by a vow, it careth for every matter rather than how this vow may best be paid. Of that which was paid for the tenth, verily a small part in place of the whole, I say nothing. This toucheth the consciences of all, but the state is free. But there is another matter of which I dare not be silent any more. We have set apart a tenth of those things which were moveable. Of the city and of the lands ye make no mention, yet were these comprehended in the vow." This matter the Senate referred to the priests, and the priests, having called Camillus into council, gave this sentence: "There is due to Apollo a tenth of all that before the uttering of the vow belonged to the men of Veii, and afterwards came into the power of the Roman people." Thus the city and the lands thereof were included. The money, therefore, was paid out of the public treasury; and the magistrates were commanded to purchase gold therewith. 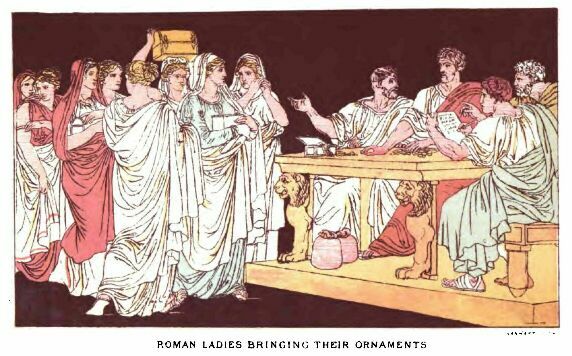 And when there was not found a sufficient quantity of this metal, the matrons, having first met and deliberated on the matter, promised that they would themselves supply the magistrates with gold, and carried all their ornaments to the treasury. Never was anything done that more pleased the Senate than this liberality of the women; and, by way of recompense, it was ordered that they should thereafter enjoy this privilege, that they should use covered chariots whensoever they went to public worship or to the games, and other carriages on any day, whether festival or common. Notwithstanding, the tribunes of the Commons were still bitter against Camillus. "Verily," they said, "by his confiscations and consecrations he hath brought the spoil of Veii to nothing." The next year there was war with the men of Falerii. These at the first, for fear of the Romans, kept themselves within their walls; but afterwards, not enduring to see the plundering of their lands, came forth, and pitched their camp about the space of a mile from the town, in a steep and difficult place. But Camillus, for he was the captain of the host, taking for his guide a man of those parts that had been made prisoner, left his place by night, and showed himself in the morning on ground higher by far. And when the enemy assailed him, as he was fortifying his camp, he put them to flight, putting them into such fear that they left their camp and fled to the city, but suffered much loss of slain and wounded before they could arrive at the gates. The town was now shut up; but because they that were besieged had better supply of corn and other things needful than they that besieged, the matter might have been delayed no less than was the taking of Veii, but for the good fortune and virtue of Camillus. It was the custom among the men of Falerii to use the same person for teachers of their children and also for their companions. Also, according to the Greek fashion, many boys would be taught by the same man. Now the children of the chief citizens of the place were in the charge of a certain teacher, that had the repute of excelling all others in knowledge. This man had been wont in time of peace to lead the boys out of the city for the sake of exercise and sport; and this custom he had not ceased even after the beginning of the war, but would take them away from the gates at one time in longer at another in shorter journeys. At length he took occasion to lead them farther than before, and to bring them, occupying them meanwhile with sport and talk, as far as the camp of the Romans. Taking them therefore to the tent of Camillus, he said, "I have delivered Falerii into your hands, for these boys that ye see are the children of the chief men of the city." To this Camillus made answer, "Neither the general nor the people to whom thou comest bringing this wicked gift is like unto thyself. With the men of Falerii we have not indeed friendship, yet we have with them as with all men a natural fellowship. War also has laws even as peace, and to these laws we have learnt obedience, even as we have learned courage. Our arms we carry not against lads of tender age, who are not harmed even in the storming of cities, but against men that carry arms in their hands. These I shall conquer, even as I conquered Veii, in Roman fashion, even by valour, by labour, and by arms." When he had so spoken he commanded that the man should be stripped of his clothing, and that his hands should be tied behind his back. In this plight he delivered him to the lads to be taken back to the city, giving them rods wherewith to scourge the traitor, and drive him back to Falerii. There was a great concourse of people to see this sight; and the Senate was summoned by the magistrates to consider the matter. So great a change was wrought in the minds of men that they who a little before had been obstinate to perish like the men of Veii, now with one voice desired peace. Ambassadors therefore were sent to Camillus, who, having been bidden by him to go to Rome, had audience of the Senate, to whom they spake thus: "Fathers, ye and your generals have overcome us in such a fashion as neither gods nor men can blame. We therefore surrender ourselves to you, making no doubt that we shall live more happily under your government than under our own laws." Peace was granted to them on the condition that they should bring the tax for that year, that the burden of the Commons might be eased. After this the Senate sent three messengers to Delphi bearing with them the offering of the Roman people to the god, namely, a mixing-bowl of gold. These messsengers were taken by pirates of Lipara and carried to that town. Now the custom at Lipara was that plunder so taken was divided among the people. But the chief magistrate of Lipara for that year, having a reverence for the character of ambassadors, and considering also that they were carrying an offering to the god, and knowing for what cause this offering was made, persuaded the multitude also. The messengers, therefore, were entertained at the public expense, and having been sent with a convoy of ships to Greece, were so brought back safe to the city of Rome. In the fourth year after these things, one Marcus Cædicius, a man of the Commons, gave information to the magistrates that in the new street above the temple of Vesta he had heard a voice louder than the voice of man, that said these words, "The Gauls are coming." No heed was taken of this thing, both because the man that told it was of little account, and because the nation of the Gauls, dwelling far off, was little known. Not only did the people of Rome despise the warnings of the gods, but also they deprived themselves, as far as in them lay, of all human help, driving away Camillus from their city. For, having been summoned to stand his trial by one of the tribunes of the Commons in the matter of the spoil of Veii (and it had chanced also that in those same days he had suffered the loss of a son that was almost grown to years of manhood), he called together to his house the members of his tribe and his dependants, being themselves no small part of the Commons, and laid the matter before them. And when they had answered him that they would contribute among themselves whatsoever fine he might be condemned to pay, but that they could not bring it about that he should be acquitted, he went into exile, first putting up to the immortal gods this prayer. "If I am not deserving of this wrong, cause, I beseech you, that this people may repent them that they have driven me forth." Being absent on the day of trial he was condemned to pay fifteen thousand pounds' weight of copper.